The information architecture of a ProtoShare project is comprised of a collection of pages. The pages are displayed in a hierarchical tree view in the Page menu. As a Reviewer, you can navigate a prototype using either the Page menu or via navigation elements on the design itself. 1. Open the Page menu. Click the Page menu item in the toolbar. Click a page name to display its active design. If a page has subpages, click the plus/minus control to display them. 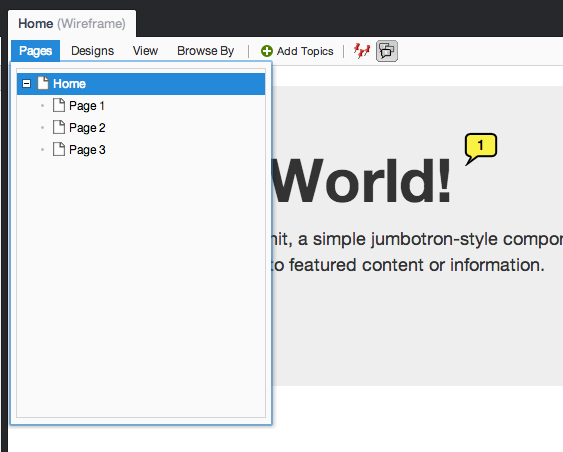 To explore multiple designs for a page, refer to Browsing Designs. The Page menu is shown below with the Home page selected.